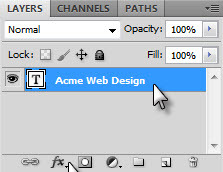 Click on the layer with "Acme Web Design" in the Layers Palette to select it as shown below. 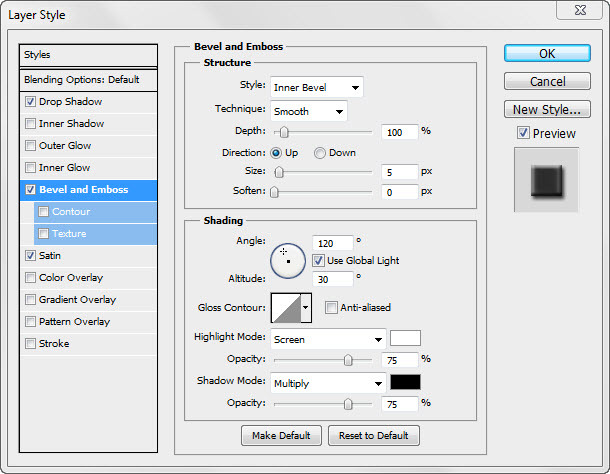 Notice the fx (Effects) icon in the lower left area of the Layers Palette. This is used to style a layer — adding a blur, drop shadow, emboss. 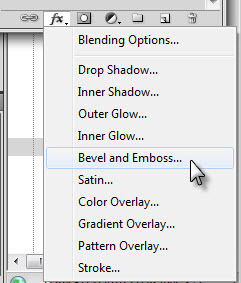 Click on the fx icon to display the styles available as shown below and select Bevel and Emboss. The Layer Style dialog box displays. Note the list of available styles on the left-hand side. Check Drop Shadow, Bevel and Emboss, and Satin. Click OK. If you feel daring, select the fx icon again and experiment with the layer styles. Stop when you are happy with your text. Remember Edit, Undo (or Ctrl+Z keys) can help to correct any mistakes. 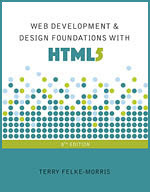 Continue with the next page to trim and save your image for the Web.